Indonesia is a South-East Asian country of huge proportions, with a rich dark history like few others, plus a volatile geology that makes it prone to all manner of natural disasters. Add to this man-made environmental disasters, fierce wildlife (dragons!) and bizarre open-air burial rites and you have an exceedingly wide range of sights for the dark tourist to explore for many weeks, if not months ... on top of everything else that this country has to offer (which is also a lot!). Indonesia had long been high on my priority list and in the summer of 2014 I finally managed to go on an extensive trip to this country (and other destinations in the region), covering all the places listed above. This was put together with (again) the indispensable help of Experience Travel Group (sponsored page) and their local partners. In the nearly four weeks that I had at my disposal in Indonesia I did not, however, manage to go any further east than Komodo Island (and East Timor). So I did not make it to the easternmost part of the country, the Indonesian-ruled western half of New Guinea/Papua (also known as Irian Jaya in Indonesia). Nor did I make it to the Maluku Islands or Sulawesi. I know of a few sites on these islands that would have qualified as dark tourism, in particular various vestiges of the Japanese occupation during WWII, but since I wasn't able to check them out for myself I can only flag up their existence briefly here. On the island of Biak off Papua a large cave and bunker system can be found, called simply Goa Jepang (Japanese cave) because it was constructed during the island's occupation by Japan. In the Pacific War part of WWII it was bombed and burned out by the US military in 1944. It's now one of Kota Biak's main tourist attractions. In addition to a nearby museum there are also various plane wrecks in the area – a special attraction for die-hard battlefield tourists. Less remote and adventurous to reach is a WWII-era Japanese bunker system on Sumatra near Bukittinggi, locally referred to as Lobang Jepang. It is part of a so-called Panorama Park and should thus be fairly easily reachable from the town. The Japanese also used POWs to construct a railway line through Sumatra, similar to the infamous Death Railway in Thailand. But I have not been able to find out yet whether there are any relics of, or memorials to, the Sumatra equivalent. The Maluku Islands (Moluccas) are another remote part of Indonesia and here, too, various WWII relics can be found. Furthermore the islands have their own war history of sorts, namely that of the Moluccan struggle for independence and against Indonesian rule, going back to the 1950s. Thousands of Moluccans were resettled to the Netherlands, where they were often housed in rather dubious locations (cf. Vught, Westerbork). In the 1970s, the Moluccans took their campaign for an independent South Molucca to violent levels within their exile Dutch territory, in particular through hostage-taking and train hijackings. In the Maluku Islands themselves, the tensions developed into clashes between religious groups: in 1999 these “Troubles” escalated to civil-war-like violence – vestiges of this (like burned-out church ruins) can allegedly still be seen, especially near the town of Tobelo. Yet another conflict also left its mark in Indonesia, and in this case it's a foreign one, namely the Vietnam War. On the island of Pulau Galang (just south of Singapore) there was a refugee camp for so-called “boat people” who had fled from Vietnam during or after the war. Today the site is a memorial, although the management/commodification of it appears to be somewhat controversial (going by this article – external link, opens in new window). Indonesia is a big country – very big. It includes several archipelagos of islands, some 15,000 to 20,000 islands in total, straddling the equator for well over three thousand miles (more than 5000 km) from Banda Aceh at the north-western tip of Sumatra to the border with Papua New Guinea in the east. The capital city is Jakarta, located on the island of Java, which is the most densely populated part of the country and politically and culturally its dominant part. Population-wise overall, Indonesia is a massively big country too, the fourth largest on the planet in fact (at over 250 million). And it's the world's largest Muslim country at that, even though other religions are also represented in some regions (e.g. Hinduism on Bali). Even more diverse is the ethnic make-up of this scattered country. This is also reflected in a plethora of local and regional languages, in particular on Papua, which is one of the most linguistically diverse places on Earth. Yet Indonesia has a single official national lingua franca, Bahasa Indonesia, a standardized Malay language related to Sanskrit (like the Indo-European languages). There are many Romance or English loan words, plus it is written in the Latin alphabet, so it looks a lot more familiar to Western tourists' eyes than any other South-East Asian languages. That does not, however, take the language barrier away! If you don't speak any Indonesian, English won't get you very far (at least outside tourist centres like Bali), so you may well need a guide/interpreter in many places (see also practicalities below). Though a nation of islands, Indonesia also has three land borders, namely on two of its largest islands, Papua (with Papua New Guinea) and Borneo (with Malaysia – the Indonesian part of Borneo is called Kalimantan). The third land border is on Timor, since East Timor regained its independence in 2002 after two and a half decades of Indonesian occupation. The closest neighbours separated by the sea from Indonesia are Australia in the south, the Philippines in the north, Thailand just to the north-east of Sumatra and Singapore at the southern tip of the Malaysian peninsula. Indonesia itself had been a Dutch colony for three and a half centuries until gaining independence in the wake of the political shifts following WWII. During the war, most parts of today's Indonesia were occupied by Japan … and predictably this was a particularly dark chapter in the country's history (costing millions of Indonesians their lives), although in the end it did help pave the way towards subsequent independence, once Japan was defeated. For a few years after 1945 the Netherlands tried to reassert their colonial rule, but by the end of 1949 recognized Indonesia's independent statehood. The Dutch did however hold on to the western half of New Guinea until the 1960s, when it was gradually “integrated” with Indonesia, albeit under some dubious circumstances. The Papuan resistance to Indonesian rule is still going strong, as is the suppression of it by Indonesian security forces. For that reason parts of the region have remained dangerously volatile right to this day. Meanwhile, Indonesia's first president Sukarno had steered Indonesia towards becoming a powerful member in the non-aligned circle of nations during the Cold War period up into the first half of the 1960s. However, his increasing leaning towards the political left spelled the end of his ca. 30 years in office. On 1 October 1965 mid-ranking army rebels assassinated six top generals in a sort of coup – although what exactly they sought to achieve and on whose orders they may have been acting has never really become clear. One top dog in the military, however, General Suharto, who was spared assassination in the coup (leading to suspicions that he may even have been behind it all himself), quickly seized on the opportunity to not only put down the coup but also used it as a pretext for a full-blown purge against Indonesia's communists. To this day, most Indonesian history textbooks claim that it was an attempted coup by the communists to take over the country and that Suharto's iron fist crushing of the coup “saved” the country. Cf. Pancasila Sakti. In reality, Suharto took the opportunity to literally exterminate the opposition. Not just actual communists, even those just vaguely associated with communists (or simply in other ways “undesirable”) were systematically murdered in the year following the 1965 alleged “coup”. Between 500,000 and a million people were murdered in these purges, mostly by local gangsters, the mafia and militia organizations, including the still powerful Pancasila Youth, which the military had recruited to do the dirty work for them (a common Indonesian tactic – cf. East Timor). These mass killings, in their scale and merciless brutality (and often randomness) could even be called a genocide. Yet it remained virtually unknown both at home and in the outside world – only recently has more awareness been raised about it through the award-winning film “The Act of Killing” by Joshua Oppenheimer. Within Indonesia, however, a proper coming to terms with this darkest chapter of domestic history has hardly even begun. Old president Sukarno was first put under house arrest, then coaxed into signing over the presidency to Suharto. Sukarno died of natural causes in 1970. During the three decades under Suharto's “New Order” regime the Indonesian population was pretty much subjugated, without freedom of speech, in effect living under a stifling military dictatorship. Economically the country made significant progress, albeit with increasingly widespread corruption playing a crucial role at all levels, in particular at the very top. Suharto and his family rank amongst the most corrupt leaderships of all time. He is thought to have embezzled up to 35 billion US$ worth in riches from his poor country. However, as his regime was regarded as a convenient bulwark against communism by the USA and the West, his reign was never truly challenged internationally. After the end of the Cold War, however, the mood gradually changed and support for Suharto waned. The reign of Suharto finally ended only in 1999 when he was forced to step down amidst economic turmoil, following the South-East Asian financial crisis of 1998. It was a time of rioting (in Jakarta and elsewhere), but also one of a fresh outlook into a future of reforms. The economy as well as democracy have indeed improved a lot since Suharto was ousted, but many of his cronies have remained in powerful positions, and the issue of corruption continues to be a big problem – one that the population has increasingly been protesting about in recent years. In the July 2014 presidential elections, for the first time a candidate without any links to the old guard was the winner: Joko Widodo, commonly better known under the shorter nickname of Jokowi. He had previously been mayor of Solo (Surakarta) and governor of Jakarta and earned himself a reputation of a down-to-earth, honest and “hands-on” kind of politician; hence many have high hopes for him as president. Whether he will indeed be able to improve things for all of Indonesia too remains to be seen. But back to dark history: In 1975 Suharto (with the approval of the USA) annexed East Timor, which had up to then been a Portuguese colony, but after the fall of the dictatorship in Portugal was looking towards independence (cf. Cape Verde). Again under the pretext of stalling a dangerous threat of communism, the Indonesians crushed any such aspirations of independence and subjected the country to a 25-year brutal occupation, including periods of violence that practically amounted to genocide as well. See under East Timor for details. At the other end of the country, in western Sumatra, the region of Aceh had also seen its share of resistance fighting against being ruled from Jakarta. Here too the Indonesian military resorted to recruiting local militias to do the “dirty work” on the ground, while using its air-force power in more direct ways as well. The latter conflict was brought more or less to an end in the wake of the 2004 tsunami disaster, when both sides agreed to lay down their arms and instead concentrate on rebuilding the devastated area. The province was granted a greater degree of self-determination, which it used to introduce Sharia law (strict application of the laws of the Koran). But otherwise peace seems to be lasting … see under Banda Aceh for more. The 2004 tsunami may have been Indonesia's worst natural disaster, but the country has also seen more than its fair share of other natural disasters, in particular earthquakes and volcanic eruptions. 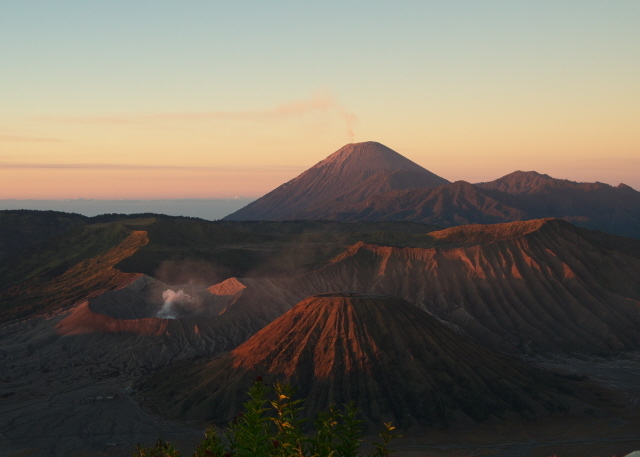 In fact, no other country has more active volcanoes than Indonesia. This includes what is probably the best-known volcanic disaster of all time: the cataclysmic explosion of Krakatoa in 1883 (which also triggered one of the worst tsunamis in recorded history before 2004). Yet, the eruption of Tambora in 1815 was worse still (four times as powerful, it is estimated, than Krakatoa), both in scale and worldwide knock-on effect. The huge amounts of ash which the volcano had released into the atmosphere affected the global climate – the period following the Tambora eruption is often referred to as the “year without summer”. 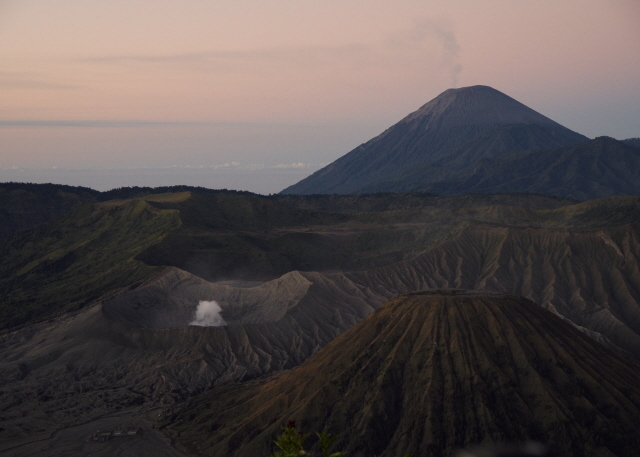 Amongst the various other dangerous and/or destructive volcanoes of Indonesia, Merapi on Java is one of the most regularly active ones, while others have become known for their scenic appeal (Bromo in particular) or other features, such as the unique blue flames of the sulphur mines inside the crater of Ijen. Not all disasters in Indonesia are so clearly natural – the mudflow of Sidoarjo, which started in 2006, obliterated several villages and covered a vast area with a thick layer of grey mud, has been attributed by many to a gas-drilling attempt that had gone wrong (though this is contested and some claim there are totally natural explanations). What is definitely a man-made environmental catastrophe is the way in which Indonesia's biosphere is being treated. Not only is slash-and-burn still a common practice in large parts of the forested areas, illegal logging remains a problem too, as does unregulated gold mining and larger-scale industrial mining of copper (and other mineral resources). One of the worst environmental issues of them all is that of palm-oil plantations – vast monoculture fields of oil palms have replaced swathes of invaluable primeval forest, especially on Borneo and Sumatra. All this is a great threat to Indonesia's flora and fauna – the planet's second highest biodiversity in fact. The most prominent animals endangered by all of this are probably Indonesia's great apes, the orang utans. But other primate species are even more critically endangered already, such as Borneo's unique proboscis monkeys. Meanwhile, however, Indonesia's incredible scenery and wildlife remain one of the main attractions for tourists – in addition to cultural riches, and of course (for a more mainstream-minded holiday clientele) palm-lined beaches, a tropically warm climate … and the party zones of the Western tourist centres of Bali. 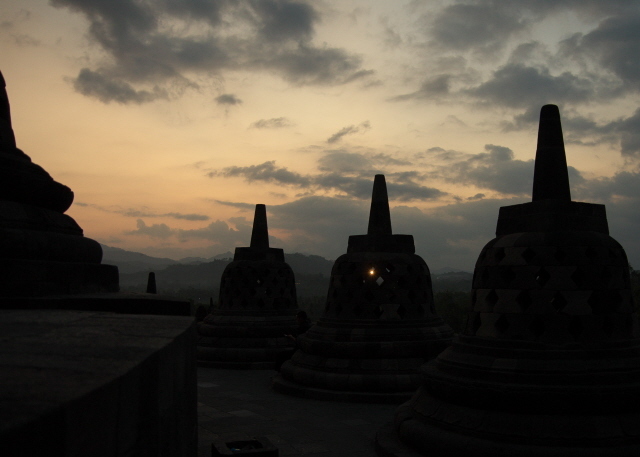 Amongst the cultural riches are a few top world heritage sites: first and foremost Borobudur, the largest and most significant Buddhist site in the world. Hinduism can mostly be seen on the island of Bali, including in the form of stone monuments as well as a plethora of ceremonies and a distinct style of dance. Catholicism is also represented, esp. in Kalimantan and Papua, but is generally less visible, and its edifices (i.e. churches, mainly) tend to be more humble in appearance in Indonesia. In addition there are still various indigenous religions, mostly animism, that survive in parts of Papua and Kalimantan in particular (e.g. amongst the Dayak people), and that despite the pressures of the monotheistic biggies and the state ideology of Pancasila that officially prescribes monotheism! By far the most dominant and most numerous type of religious-cultural manifestations in stone (and sometimes wood) are mosques. Being the largest Muslim country on Earth, Indonesia may well have more mosques than the rest of the world put together. A few are architecturally significant, e.g. the grand mosque in Banda Aceh, many are extremely picturesque, including many newly built ones. There are also impressively huge ones, in particular Istiqlal Mosque in Jakarta – the largest in South-East Asia. But overall, there are mostly smaller-scale, and less elaborately decorated “everyday” mosques everywhere – in fact more and more keep springing up … as if there weren't any other uses for resources in a country still struggling with poverty as much as Indonesia does. But that seems to be a wider trend in the Muslim world these days (cf. also e.g. Senegal). One significant aspect of a country's culture (at least in my books) is its cuisine. And Indonesia's is certainly intriguing. It varies regionally a lot – far beyond the ubiquitous mie and nasi goreng (fried noodles and rice, respectively), which have also become international staples. Most meals revolve around rice with types of curries and condiments, such as sambals and ketjap, which are commonplace. Sambals are mixtures of mashed chillies and other ingredients, such as minced onions or shrimp paste. The internationally available sambal oelek pales to nothing in comparison to a freshly mortared sambal with the extra zing of lime. Even commercially manufactured sambal trassi or other such variants available in jars are leagues above the over-salty simple sambal oelek you find in the West (even in Chinese restaurants, where they don't belong in the first place). Ketjap, may have given rise to the word ketchup in the West, but is actually a type of thick soy sauce, either savoury (asin) or sweet (manis) – and does not contain any tomatoes at all. Barbecued small fish (ikan bakar) is a ubiquitous dish along Indonesia's endless coastlines and river banks, as are BBQed skewers of meat, called satay. Another widely available staple is gado-gado – often a saviour for vegetarians, as it is made from boiled vegetables served with a peanut sauce. However, tofu and tempeh are also fairly widespread so even vegans can get by fine. One general tendency of Indonesian cuisine is that it is typically much heavier and sweeter than most other Asian cuisines. In fact, Indonesia allegedly has the highest per capita consumption of sugar in the world. On the drinks front this is also reflected in very sweet coffee and tea as well as the usual soft drinks that are very popular here. Indonesian coffee, be it from Java, Sumatra or elsewhere, is famous worldwide and can indeed be very good. Putting milk in coffee (or tea) is practically unheard of in Indonesia, though. Alcoholic drinks naturally don't play much of a role in such a Muslim-dominated country, but in most parts it is not strictly forbidden (unlike in some Arabic countries), except in some especially conservative areas such as Aceh (which even has Sharia law – so you won't find any alcohol available there at all). Mostly it is tolerated, as long as it's not displayed or consumed too publicly. Prices, however, are very often so prohibitively high anyway that this alone strongly suggests abstinence. In some areas where Islam is not the dominant religion, things can be more relaxed, especially on Bali. Not only are the Western-tourist resort towns of Kuta et al as fuelled by alcohol as they are anywhere in the world, there are even wine-makers on Bali. How they pull this off in such a tropical climate, I don't know. But I tasted a few of their varieties and most were surprisingly decent. On the beer front things are dire, though. The domestically brewed factory beer brands are as bland as those of the international brewery empires who own them. On the other hand, in the often hot and humid climate of Indonesia a simple tasteless but cold and fizzy lager beer may be just the refreshment that a typical tourist requires. And that at least is easy to get hold of almost everywhere in the country. Even many (moderately) Muslim Indonesians indulge in it quite happily. A really local traditional tipple of much more potent strength is “arak” – sometimes classed as a variant of rum, but can be distilled from various main ingredients other than sugar or molasses (esp. coconut). I had the chance of trying a “poteen” version from a village in Bali once, and it was ... well, “an acquired taste” would be the polite way of putting it. Water from taps is not potable in Indonesia! Unfortunately, this means you have to buy bottled drinking water – and that in a country that already struggles with strewn rubbish everywhere. At least do not follow the locals' habit of simply chucking everything everywhere wherever they are but make sure your empty bottles end up in rubbish bins (though that is no absolute guarantee that they will not end up in the Great Pacific Gyre all the same). As for another nasty habit: Indonesians tend to be heavy smokers (well, the male population – I hardly saw any women smoke), and especially popular is a unique type of prototypically Indonesian cigarette that is flavoured with cloves, called “kretek”. Since they contain far higher levels of tar and nicotine than regular cigarettes, kreteks are hardly ever available outside Indonesia (in several countries they are even illegal). Despite their elevated unhealthiness, though, the clove component in them makes their smell less nauseating for non-smoking bystanders, as I found out to my pleasant surprise. While I normally find that exposure to regular cigarette smoke makes me feel rather sick quite quickly, this was not so much the case with kreteks. Not that I want to promote them, I hasten to add! Accommodation in Indonesia comes in a huge range of standards, from rock-bottom roughing-it to some of the finest luxury abodes you can imagine. The mid-range too can be of very high quality – and that at quite reasonable prices, especially in places where there is plenty of competition (Bali or parts of Java in particular). If you're on a tight budget and don't mind basic places you can save a lot of money on accommodation – but if you can spend a bit more you can find absolutely heavenly places at rates that don't have to break the bank. Even at the higher end, the value for money can be astounding, especially compared to what you may have to pay for equivalent standards elsewhere in the world. See my updated top-10-list of best accommodations I've ever had … there are two new entries from my summer 2014 Indonesia trip in it now, and another one in the runners-up! Getting to Indonesia is quite easy by plane, but naturally restricted overland, given the few land borders that this island nation has. The only other common way of travelling is by sea … but that can come with its own risks – see below. The main international hubs for incoming international flights are Jakarta and Denpasar in Bali, which are served by a plethora of big name airlines. Indonesia's own national carrier is Garuda (the only one certified to fly to destinations in Europe and the United States). Air Asia, a Malaysian budget airline, also flies to various destinations in Indonesia. There are countless smaller and regional airlines in Indonesia serving a wide network of smaller airports all over the country, but quite a few of them have somewhat dodgy reputations (some are even blacklisted), use rather ageing aircraft, and can be unreliable. But if you want to travel greater distances, especially between islands, you will probably have to entrust yourself to them at some stage. I had to do so on several occasions – but I must say that everything went fine, notwithstanding a couple of delays caused by tropical storms (hardly the airlines' fault, of course). Ferries are another way of travelling between islands, or even between countries. On shorter routes (e.g. between Bali and Java) this is usually fine. Longer distance travel on water is a different story in Indonesia, though, where ferry disasters happen with depressing regularity. Tourist boats are also affected by low security standards, as was shown yet again in August 2014 when a tourist boat travelling from Lombok to Komodo sank, leaving the passengers having to cling on to the capsized hull or swim to the nearest islands (one of them with an erupting volcano on it – clearly a case of out of the frying pan and into the fire …). In parts of Borneo, transport by water is the norm, since often there aren't even any roads at all. The more touristy parts support fleets of boats made for the purpose, so that's not a worry, and can actually be quite a magical mode of travel, in particular in Tanjung Puting National Park, Central Kalimantan. Here you can watch wild proboscis monkeys from the comfort of the deck of your boat or walk ashore to see semi-wild, habituated orang utans at special feeding platforms. Elsewhere, overland travel by road is dominated by millions and millions of motorbikes and scooters, mostly for private transport (but see Sidoarjo), and by buses and minibuses for public transport. The latter may be fine for daring backpackers but otherwise (and especially if you have much luggage) they are not ideal, being often overcrowded, hot and uncomfortable. For some remote locations you'll need a car in any case. Getting behind the steering wheel yourself in Indonesia cannot be recommended, though. Traffic is manic and if you are not used to the swarms of motorbikes swirling around you in often unpredictable ways you're bound to get caught up in an accident within minutes, at least in the more populated parts of the country. In remoter areas, roads can be very bad, thus also requiring special (4x4) driving skills. So in order to get to some places (like Ijen for example) you may need to hire a car with a driver/guide. On Java (and a small part of Sumatra), trains are an alternative. Some can be quite swish and modern even. I used the express train from Yogyakarta to Surabaya and it was fine … except for the loud muzak piped into the carriage and the air-con turning it into a rolling fridge. Train attendants then go round selling blankets to flimsily dressed tourists, but once these blankets are peddled they turn the air-con to a slightly more reasonable temperature. Cheeky business idea. So if you have to use such trains, be warned: come prepared with your own extra layers of clothes (including a woolly hat) and earplugs! Of course, not all trains are like that – local commuter trains in particular can be more like the cliché you may expect from having seen images of trains in India: ramshackle and overcrowded, with people crowding the aisles, doors and even the roofs … best to be avoided. A general thing: independent travel in Indonesia is logistically tricky to plan ahead from abroad. Few internal flight connections or other domestic transport can be booked online. Instead tickets have to be bought on the spot or through local agents. So you either need plenty of time and must be very flexible, OR, if that is not an option, you have to go through international specialist travel agents to book things ahead for you. As the latter was the case for me with my strictly limited amount of time available, I went through a trusted specialist company that I had used twice before (for Sri Lanka and Vietnam/Cambodia/Thailand), namely Experience Travel Group. They, and their Indonesian partners, did a brilliant job putting a complex itinerary together for me, to my exacting and often rather “exotic” specifications, e.g. regarding particular destinations that few “normal” tourists ever visit (e.g. Bledug Kuwu). In the the end most of my wishes could be accommodated, and mostly it went like clockwork once on the ground … a few unavoidable glitches here and there notwithstanding. But by Indonesian standards it all worked pretty much perfectly. So again I can only wholeheartedly recommend them. So if you are thinking of travelling to Indonesia do check the sponsored page for Experience Travel Group here!